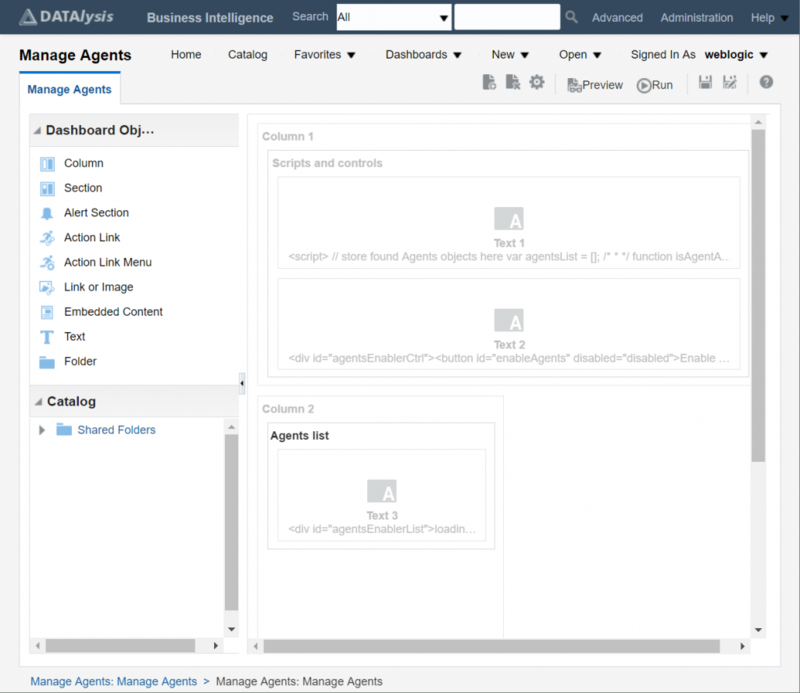 Few days ago I wrote about Agents in OBIEE 12c and how it was possible to enable them by script, automating that part of the process which was still manual. This time I’m going to write about 2 examples of how I used my findings about Agents, providing the code as download so you can use it in just few seconds. Today I’m going to cover two possible needs with Agents, one mainly for upgrades or code promotion between environments and the second to provide a functionality to the consumers of your OBIEE dashboards and analysis. All the tests and analysis have been done on OBIEE 12.2.1.2.0. Keep in mind jQuery wasn’t there in OBIEE 11g, so that’s the main change required. In a running prod OBIEE you can easily have tens or hundreds of Agents: nothing bad with this, they provide functionalities for the consumers. But what happen when you upgrade your old PROD OBIEE 11g to OBIEE 12c? What happen to the Agents? Well … the Agents end up on the new system but … all disabled ! Now have fun going through the full catalog, finding out which Agents must be enabled and enable them again one by one, by hand. Not funny at all without forgetting the risk of missing some and have your consumers complaining your upgrade is actually a regression. Stop fearing your next upgrade, you can enable all your Agents with few clicks from a single page. In your OBIEE instance go in the Catalog and create a new empty folder (to avoid issues in case you have a dashboard with the same exact name of the one in the file already). Can be your personal folder or the shared folder, works in both places, the path doesn’t matter. 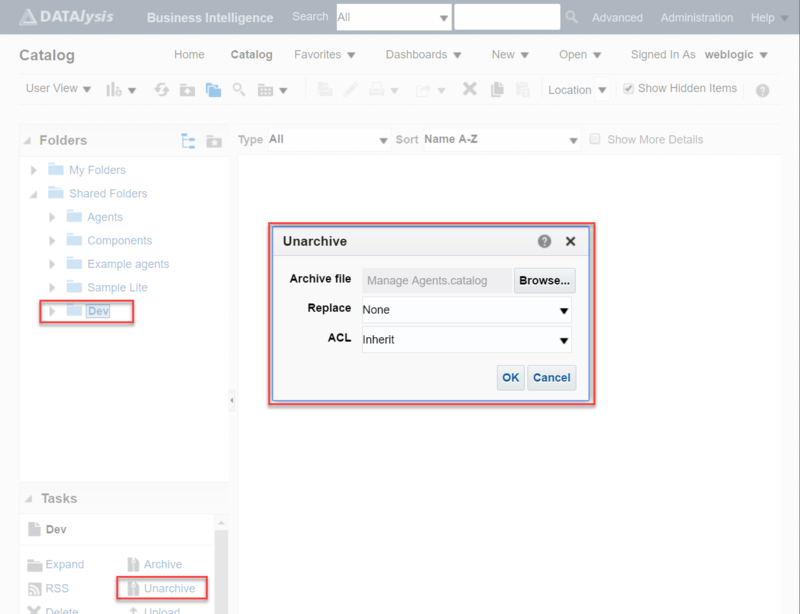 Download the file (a catalog archive) and unarchive (first unzip, then OBIEE unarchive) inside the newly create folder. A list of all the Agents found in the catalog. Select the Agents you want to enable (or all of them using the “check all” link) and click the button. If you are sure confirm. Select Agents from the list (or all with the “check all” link), click the “Enable selected agents” button and if you are sure confirm. Done ! You can now enable lot of Agents at once. 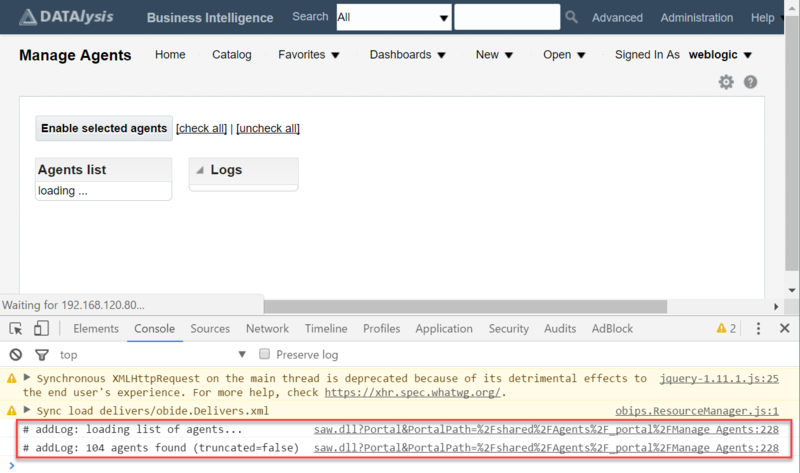 If the page doesn’t work or take too long to load the list of Agents have a look at your browser console, it gives some output faster than the log box on screen. Loading the list of Agents can take some time (10-15 seconds for 104 Agents). The console log give you an output of what’s going on while waiting. It uses the embedded jQuery in OBIEE 12c to manage everything: load the required files, actions on checkboxes and button, output to screen. Feel free to take the code and change it as you want, you can easily add a disable action too. Something you will maybe want to do is to customize the search of Agents in the catalog by defining a specific path and pattern for names. You can adjust the value of “path” and “mask” as you want, even add them on screen as text field for a more interactive experience. I have enabled 102 Agents at once using this script: the page become unresponsive at the beginning when things are running but just leave it there, few minutes later all the Agents were enabled! As this script does exactly what happen when you click one by one in the catalog the same limitations apply. If your users don’t have the required permissions on the catalog to access the Agents or to enable them this script will not bypass these limitations. It uses the privileges of your current session, so it’s advised to use it with an admin-like account. 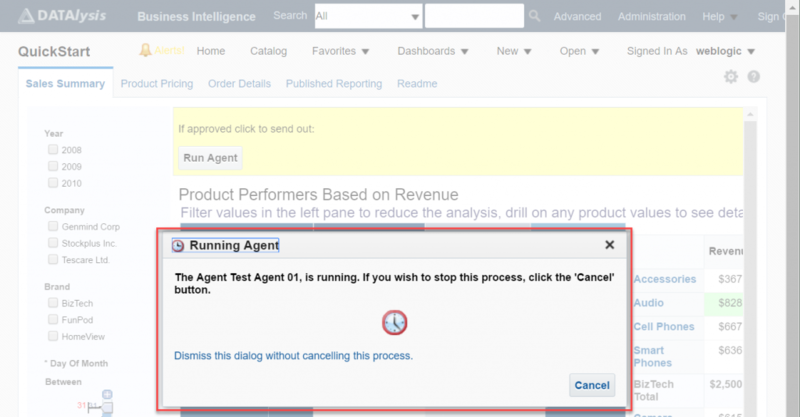 Sometimes you want to allow your consumers to execute an Agent, run it immediately, from a dashboard page or an analysis. For example if you have somebody in charge of validation of some data/analysis before to send it out to a wider audience. The approval can be done visually using a dashboard or an analysis, and then to send out the data/analysis you can use an Agent setup without schedule and containing the full list of people, so you find it in the Catalog and click on “Run” directly. Wouldn’t it be better if you could have a button directly on the validation dashboard page? Clicking a button on the dashboard page execute the Agent. Good news again: doable with a really small piece of code. All you need is a text object with the required code inside. In this code the path to the Agent is hardcoded, you can definitely change it or make it smarter (a generic event handler reading the path from an attribute of the button HTML tag). Can be executed by a link or anything else as long as it can be triggered in a way or another. The execution window popup just like in Catalog. A full example of the script in action. As this script does exactly what happen when you click “Run” in the Catalog the same limitations apply. If your users don’t have the required permissions on the catalog to access the Agent or to run it, this script will not bypass these limitations. It uses the privileges of your current session. As you saw in the above examples a lot is doable. OBIEE is a web application which means you can easily hack pieces and reuses its own libraries for your needs. If you want to see the details of other actions available on Agents find the actionhandlerimpl.js file on your OBIEE instance (you will find the same file few times) and look inside. If you check the saw.catalogaction.IbotsActionHandler.prototype.handleAction function you see all the actions available in the Catalog for Agents and the same file has details on actions on other kind of objects. Do not abuse it! If you end up recoding half of the UI you maybe chose the wrong tool for the job. Feel free to post a comment if you have issues using the code in 12.2.1.0.0 or 12.2.1.1.0, I can easily have a look at those versions, for 11g it’s a bit more difficult as I don’t have environments easily accessible. Great post and solution. Thanks! Looking at the console provides the error : unexpected token = ( saw.dll line 228). Also, looks like the functions do not load to the page. Are you familier with that problem? What version of OBIEE are you using? You find an example of the code to execute an agent from a button. As said the main issue is 11g doesn’t have jQuery, a library making the handling of things a lot easier. But the OBIEE libraries are the same (or almost identical). Thank you for the input.It is still not enabling the option to run the agent. Do we need to run any scripts other than mentioned in the solution. Perfectly worked like that quite a lot of times for me. So what you can do is look at the console of your browser and debug it from there, calling functions by hand to see if they are there and all the files loaded etc. it works in the OBIEE 12.2.1.2.0 without any problems. Thank you for this solution – it’s very useful! I have a question: Your script returns agents only from “Shared Folders” (/shared/*). Is possible to get all agents – even from “User Folders” (/users/*)? The script actually search in shared folders and the “my folder” of the connected user. If you look at the script you see the search uses the param “path: /” and not “path: /shared”. The problem is that security is applied, and from the front-end of OBIEE you can’t navigate to other users folders, you have access only to your own “my folder”. You can maybe use Catalog Manager (the client installed next to Admin tool), that one can search at a different level and also into /users folders as long as you have the right permissions. But even by taking a list of objects from there the script will hang because when retrieving the agents details the security will kick in. OK, I’ll try to use the Catalog Manager. Gianni, thank you for your the next recommendation. Did you find a way to search in user folders? We were having issues at first even getting this to work, but we think that either custom analyticsRes or SSO were blocking it. However, this only brings back shared folders and we have no idea how many user report agents exist. Users folders are protected by security: only the owner can look inside and do things there. And actually the users folders aren’t at all exposed in the tool as only the “my folder” is accessible. So you could search into “my folder”, but you would need to login with every single user to go over the various person folders. To find how many agents are into users folders you can use Catalog Manager as he has a wider access to things. I have similar requirement like to show and run agent from my dashboard.I have hard coded my agent path in the above script. But when click on run button on my dashboard throwing below error. do we need to set any configuration here? please suggest. No config is needed but you must be allowed to run the agent. So standard permission model apply and any user wanting to click the button must have the same privileges if doing that in the catalog itself. I have given full control permission for consumers and administrators roles on my agent in catalog, but still getting above error. Apparently that’s not what OBIEE sees. Can you go in the catalog and run it from there? I can able to run the agent successfully from my catalog folder, no issues. So it seems an access issue. And the answer is what I said yesterday already: you have to check the “HTML” checkbox for the text block. 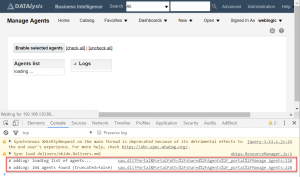 In 12.2.1.3 Oracle added an extra security disabling HTML everywhere, so you have to enable it. That’s what Michael posted on the ODC thread. It works perfectly in my system. I was able to execute an agent from the dashboard page. My question is how have you found this script ? Is this something present ? I can see ServerRequests.JS and AjaxRequest.js in my OBIEE environment. If we want to develop or modify scripts like this what is the starting point would you suggest ? First: I would highly suggest you never edit a default file of OBIEE but create your own customization (so it has more chances to survive upgrades and patches). How I have found it? I looked for it. OBIEE is a web application, as such everything happening can be analysed using your browser and in that way you manage to find the right functions and how to call them. Just make sure to analyze enough how things are done by OBIEE so your customization will be aligned with it and aren’t going to introduce errors OBIEE itself would avoid. This is works good and will be very handy when we roll out OBIEE 12c. It seems to be limited to locating/listing 300 Agents. I see the truncated=yes in the log messages. I don’t see a limit set in your code. Do you where this limit is set so that we can locate and list more than 300 Agents? The limit of 300 is the limit you get in searching for objects in the catalog page. They are both set by default to 300 and do not have a description giving more details on their real impact, but the names seems to match. They need to be set in the OBIPS config file inside WebConfig/ServerInstance/UI. Thank you so much. It was the ‘MaxSearchResultItemsToReturn’ XML tag. I set it to 1000 and I get the complete list of Agents now. I thought I would reply back in case anyone else ran into this. Is it possible to open a Create Ibot Webpage with all the information like analysis, subject etc pre-filled? I would say you can’t … Replied on the ODC thread too. There are too many information required by an agent, so it’s kind of difficult to pass them as parameters. You can for sure create objects by scripts (webservices etc.) but it’s a different thing. Excellent utility, saved our project a lot of time, many thanks!!! Great stuff, We could easily adapt the code so it also features disabling agents. Real timesaver. In theory everything is possible, it’s a webpage in the end, so you can hide everything you want. In practice I wouldn’t put my hands there. Too many risks to break other things, so not worth the effort I would say. This script is really just about mass enabling agents in a context of a migration. When the analysis you send by an agent has filters you are prompted for the values to set for the filters at that time and those values are saved into the agent. So if you want to change the value and set it as “Stockplus Inc” you will need to edit the agent and set that value, save the agent and then run it. You can still do all that by code (webservices to edit content of saved objects exists), but it’s a multi-steps process. Hi, can you tell me which version you are using? And also if how does the URL of your OBIEE looks like in general? (protocol, port etc.). Of course we agree you can do a search for agents in the catalog with the user you are connected, right? The user that is searching should be able to view the agents as they are able to access the root of the catalog using the client tool. If in the web UI you open the catalog and do a search there for agents, does it work? Having access to the root of the catalog doesn’t mean the user can access other folders and search. The script just use that search you have in the web UI, nothing hidden. I will test it on a 12.2.1.3 but I would imagine nothing really changed in what the script uses in that version. Just tested on 12.2.1.3 on linux and works just fine. So the source of the error you got is somewhere else and not related to the version. Regarding the button for Execute an Agent from a dashboard page, I have this button in production which is used to invoke one Agent and that Master agent has multiple agent to invoke which is causing some issue and server overload. So I am searching for option where I can put a condition where ibotHandler.runIBot(ibotHandler.tItemInfo.path); will not run till it is after 5 PM EST and if I can add multiple agent run instruction in this script to run in specific interval. Please suggest ! Thanks Gianni for the reply. Actually there is a validation report where Business will validate the current monthly data and after validation click the button to execute all the agents. But they can click the button any time during the day. So I want to keep the execution “on wait” till it’s 5PM. In this way they will invoke the process of Agent execution but it will only run after 5 PM. There are multiple Agents also so if possible I can put a wait time in between those Agents. So for that, as said, you can use default agents behaviour: schedule your agents from 5PM on with the intervals you need (based on your guess on exec time or load or looking at past executions etc.). The agents will run daily or at the required higher frequency and you add to each one a condition to decide if they really need to run or not. If you don’t want to the schedule all of them you can chain them: not one agent calling all the others but a real chain, one calling another one etc. The condition can be a very simple check if there is a row matching a criteria in a table. That row can be inserted by your users via the front-end using write back for example, your condition will check if there is a row matching the current day (so you don’t need to delete inserted rows after execution). Will match your needs and all done with out of the box feature of OBIEE. We are using OBIEE version: 12.2.1.0.0. Incompatible version when reading object “CatalogInputStreamer”. Version read: 16, min expected: 11, max expected: 15. Any chance you can publish / offer version compatible with OBIEE 12.2.1.0.0 ? This thing is out of support for more than a year now and, being the very first release, is full of bugs. What about planning an upgrade to a supported / recent version? I am using 11.1.1.7. ‘Run Agent’ button is still grayed out. Even I enabled all my agents and put correct path. Ideally you deploy jQuery in your server inside your custom style, you load it in the page and just take things from there. There code between 12c and 11g is 99% the same based on what I posted in that forum 2 years ago. I have a request where I need to allow user to modify/update the email recipients on their own. We cannot provide access to edit and update the agent instead we are looking for similar page where it would list the all email recipients against each agent. Could you provide any suggestion. Hi, the recipients can be explicit and in this case they are saved into the agent itself, you find them in the XML. There are methods to get the XML of the agent, there is maybe even a function in JS to get directly the recipients but you would need to explore a bit the libraries, otherwise just parse the XML and get what you need out. The other way for an agent to get recipients is by getting them into the analysis used as condition, so this one would require more works and to execute the analysis to get the recipients. In the end the point is that everything is possible, but it’s up to you to evaluate if the work required is work the result. Also don’t forget security: users would need to be able to access agents as the page isn’t static, it uses the connected user privileges to do the job.